Shenandoah has a lot of subplots, but the central narrative is easily summarized. The Anderson family, headed by widower Charlie, are non-slaveholding whites living in the Shenandoah Valley during the Civil War. The film never tells you exactly when it takes place, but a reference to a Union victory at Winchester and the presence of several black Union soldiers makes me think it’s the fall of 1864, possibly extending into the following spring. Anderson’s family is proudly independent of the Confederacy. They work their land themselves and oppose slavery as an institution. Anderson’s sons, especially Jacob (Glenn Corbett—the original Zephraim Cochrane to you Trek geeks) his oldest, are less rigid in their anti-Confederate stance and occasionally think about enlisting (Levin’s note about the improbability of them avoiding the draft is relevant here) but they never do. Despite the family’s opposition to the war, it seeps into their household anyway and eventually tears it apart. Cannons are heard early in the film as a battle rages nearby, the youngest brother, Boy (Phillip Alford), finds a Confederate kepi and claims it as his own, Confederate recruiters come to the farm and the family rejects their offers, Charlie’s only daughter Jennie (Rosemary Forsyth) marries Confederate cavalryman Sam (Doug McClure) only to have their wedding interrupted when he has to go to the front. Everything breaks when a Union scouting party mistakes Boy in his kepi for a Confederate soldier and captures him. In the last act, the family becomes active (if irregular) participants in the war, as they use guerilla tactics to find and release boy, even hijacking and burning a Union POW train (Boy isn’t on it but Sam is). By the end of the film, two of Charlie’s sons have died and his daughter-in-law Ann (Katharine Ross) has been raped and murdered by “scavengers.” The film offers little resolution, closing with Boy reuniting with the family during Sunday service and singing “Praise God, From Whom All Blessings Flow” (coincidentally, Robert E. Lee’s favorite hymn). This war is like all wars, I suppose. The undertakers are winning it. The politicians talk a lot about the glory of it, and the old men will talk about the need of it, but the soldiers, they just want to go home. This is pretty close to the revisionist take. The stated political and social causes of the war don’t really matter. Once unleashed, war becomes its own thing, preying on the lives and psyches of the soldiers and civilians it touches. This is the same message The Keeping Room tried to to convey, but Shenandoah does a better job by not using as many Civil War cliches (admirable, given its 1965 release) and offering brief but critical glimpses of ways the war really did benefit certain classes of Americans. Indeed, Shenandoah shows remarkably progressive views on race and gender. When the Andersons suit up to find Boy, Jennie insists on accompanying them, having capably handled a gun in a previous scene. In this way, the film provides a small glimpse at how women used the war to expand their social roles, especially in the South. This is admittedly subtle, but Shenandoah is more overt in its treatment of slavery. Boy has befriended a neighboring young slave named Gabriel (Gene Jackson). At first, Gabriel seems like a typical Hollywood slave character—innocent and loyal. Events surrounding Boy’s capture seem to reinforce this characterization. Boy asks Gabriel to run home and tell Charlie what happened, but a black soldier says Gabriel doesn’t have to take orders anymore because he’s free. Gabriel goes anyway, seemingly valuing loyalty to a white friend over his own freedom, but after telling Charlie, Gabriel asks Jennie if the soldier was right. She says he was and Gabriel is free to go wherever he wants. Gabriel takes this to heart and marches away from the house. He shows up later in Union blue and saves Boy’s life during a skirmish. The implausibility of this meet-up notwithstanding, it’s a surprisingly modern take on the transition from slavery to freedom to Union service. So, Shenandoah ultimately has a fairly nuanced (if outdated) view of the Civil War and the Confederacy. Although war itself is the primary villain and both the North and South are ultimately victims of its malevolence, the film nevertheless defines the Confederate cause as explicitly pro-slavery (Charlie says so within the first 15 minute) and Gabriel’s experience shows that, whatever the war’s horrible costs, it certainly brought good news for southern slaves. 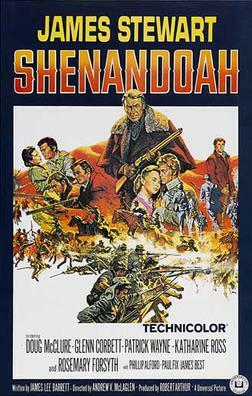 We can say this is an oversimplification but it’s enough that I’d put Shenandoah above Cold Mountain and The Keeping Room for its treatment of the war’s causes and would give it much higher historical marks over older films like The Good Rebel and Gone With the Wind. This was a good movie overall, but, just as the Anderson household began to unravel in the final act, the story did too. Charlie’s attack on the Union POW train seems like a big leap, especially the decision to burn it. His main opposition to the train is that “it takes men where they don’t wanna go” but that seems extreme. He can hate the war, but these men aren’t innocent civilians being sent off to camps, they’re captured soldiers. At least they’re not dead. One explanation for the train scene is that the movie eventually adopts the Lost Cause trope of Confederate soldier = honorable and Union soldier = jerk. When we meet Confederates, their motivations are always noble and they’re never represented as part of the slaveholding gentry. Union soldiers, on the other hand, are gruff and callous. The only exception is Union Colonel Fairchild (the always great George Kennedy), who Charlie asks to try and find Boy. Like the Union officer in The Good, The Bad, and The Ugly, Fairchild has lost faith in the war and appears completely exhausted. He can’t help Charlie but the two share a moment of sympathy over the futility of war and the loss of loved ones. Fairchild was a real guy, by the way. However, he was wounded by this time and no longer on field duty. Good use of music overall. Unsurprisingly, “Shenandoah” is the Anderson’s anthem, but other Civil War tunes mark certain key moments and themes. “Kathleen Mavourneen” plays during Jennie’s scenes with Sam, Gabriel’s decision to pursue his freedom is accompanied by “The Battle Hymn of the Republic,” and someone is playing “The Yellow Rose of Texas” on a fiddle in a Confederate camp. Not to keep beating the Point of Honor dead horse, but I think it was trying to ask the same central question as this film: how does an anti-slavery family navigate life in the Confederacy? The key difference is the show’s inexplicable decision to make the central family slaveholders themselves, rendering their political stance inexplicable and unbelievable. The Andersons aren’t quite southern unionists like Newt Knight, but their circumstance as a fiercely independent family living in the Confederate South is much more plausible. Does it mention slavery? I already covered this above, but it bears repeating how rare Gabriel’s experience was in Hollywood films up to that point. Is this the first popular film to show black soldiers in significant numbers? Do we see this kind of thing again until Glory? What strikes me about the Charlie Anderson quote… “This war is like all wars…” is how exactly it reflects a mid-to-late 20th century view of war in general as portrayed popular media. I read it just now and I was taken back to watching M*A*S*H all those years. The passage could have been copy-pasted into any number of films or t.v. shows between the mid 1950s and the late 1970s and would have fit right in. To what extent, then, do we misjudge this movie by prioritizing it’s place in the historiography of the Civil War and not as it’s place in the emerging 1960s anti-war zeitgeist? On the matter of anti-slavery families in the Confederacy… Vicki Bynum has that down, as you know. The problem is that there were plenty of super-ambivalent-about-slavery (you can judge otherwise, and I might, too) slaveholders who supported the Confederacy, plenty of slaveholders who were anti-Confederate, and even more non-slaveholders who were “all-in” on the CSA. So that premise of Point of Honor that you cite isn’t that outrageous in my mind. Historians in general have only given slight attention to these complicated figures, and it’s only getting worse as the “new-materialists” (Charles Irons’ term for Ed. Baptist, et. al.) deny any motive power to anything other than the cruel logic of capitalism, and the popular discourse understands the Civil War through single-factor analysis of the Cornerstone Speech and the Mississippi Declaration. You’re dead on about the film’s place in it’s 1960s context. I like to keep these posts short, but I tried to cover that by mentioning the revisionist school, which was how the mid-century view on war manifested itself in Civil War historiography. Of course, it predates this movie by a decade or two, but it’s no surprise to see it get a second wind in the 60s. As far as Point of Honor goes, the problem isn’t that its characters were ambivalent about slavery, the protagonist is practically an abolitionist. This is presented without any nuance or complication, rendering it both historically and dramatically implausible. That being said, I suspect you’re right that there’s a healthy vein of research to be tapped on southerners who were not devoted to slavery nor fiercely unionist. Oh, don’t mean to suggest that watching this film through the Revisionist School lens isn’t invalid. It is, and you did a great job. And, yeah, Point of Honor is ridiculous all around and I certainly wouldn’t defend it’s premise, even if it might contain a shadow of a real historical problem.